"Land Records, Deeds and Transactions"
Established in 1872, Graham County consists of land that was once held by Cherokee Indians. 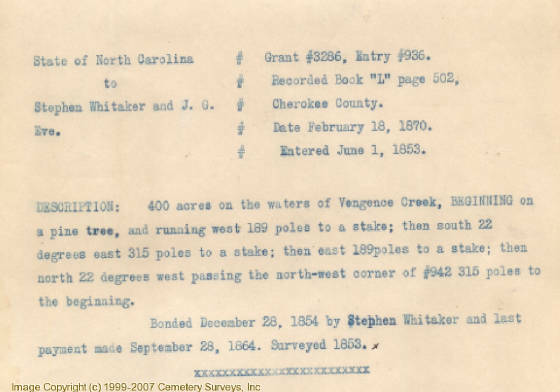 Researchers should be aware that because Graham was formed from part of Cherokee County, some deeds to land in present-day Graham are recorded in Cherokee County deed books. Most of the Indians in Graham County have lived along the Cheoah and its creeks in the southwest near Little Snowbird Creek, and in central Graham along Buffalo Creek West. A number of them held title to their land by purchase and not by occupancy. Thus, many American Indian (aka Native American) names are recorded in the deed books of the county. Record of Deeds, 1873-1880, #1-272: Sale of land by Takanochulah to William W. Cooper, Nov. 12, 1874; sale of land by State to Takanochulah, Dec. 21, 1875; sale of land by Stephen Whitaker to Tarquaty, Aug. 16, 1876; sale of land by Corn Silk and others to W. Cogdill, Aug. 26, 1876.